Ukulele Mele On Maui is a ukulele education and ukulele entertainment business based in the Aloha State, on the Hawaiian Island of Maui. Our purpose is to spread the joy of making music through teaching 'ukulele and performing with aloha worldwide. Welcome to the chance to take private one-on-one ukulele lessons from Ukulele Mele via webcam from the comfort of your home. Mele Fong, aka Ukulele Mele, is a professional singer, song arranger, and master of multiple strumming styles for ukulele. Whether you are brand new to string instruments, beginning ukulele and can play a few basic chords and strum a little, or are an experienced ukulele player ready to play songs with more chords and complex strums, you can have fun learning to "Watch. Listen. Play. The Ukulele Mele Way." Solve problems from trying to teach yourself by learning from a professional on Maui without having to travel. Start good habits to minimize hand and muscle strain the Ukulele Mele Way. Form chords with the left hand while strumming rhythm patterns with the right hand. Play fun sing-along songs arranged for your skill level. Follow easy to read song sheets without having to read music. Build confidence and gain an authentic cultural experience learning to play Hawai'i's official instrument from a Native Hawaiian. HOW DO PRIVATE WEBCAM LESSONS WORK? Lessons last 45-minutes, and are pre-scheduled based on Hawaii Standard Time. You select the songs you want to learn from Ukulele Mele's arrangements in the online Strum Summary, Packaged Song Sets of Book/DVD/CD, online Fan Club, or Monthly Online Subscription Lessons. Telephone: (808) 281-4981 anytime between 9:00am and 7:00pm Hawaii Time. Location: Aloha State, on the Hawaiian Island of Maui. 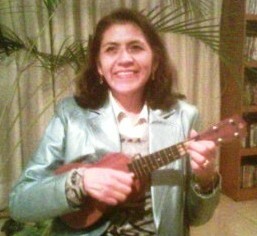 Maria Granillo - Mexico City, Mexico 25 January 2015 "I live in Mexico and I found Mele in a video playing ukulele with her husband Rich. I started to study with Mele online and her lessons are beautiful. I have learned and enjoyed too much with Mele. Mele, thank you for helping me so much, for being very nice with me, for taking your time to give me tips, for teaching me a lot of things to learn ukulele and make that I can do it. Thank you for being my teacher. We wait for you in Mexico City!! Mahalo Mele! Muchas Gracias Mele!" Michael H. and Markus M. - Austria 4 September 2012 (lesson 27 August) "The ukulele lesson with Mele was a birthday gift to our friend Marcus (right person in the picture) who joined us in Maui during our vacations. Markus and me are both guitar players and the lesson with Mele was the first lesson with a ukulele. We started with basics on how to hold the ukulele and how to play it right. After that, we learned the basic chords and played several songs with Mele who gave us great instructions and also sings during the playing. Mele is a great teacher. She gave us a lot of background information and hints during the lesson which improves the understanding and quality of playing ukulele. 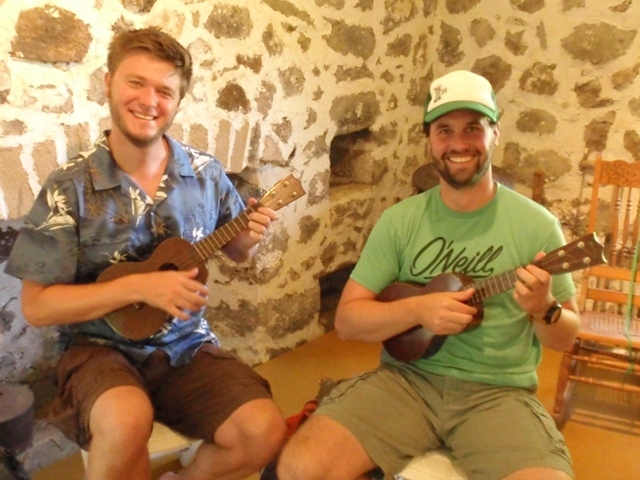 We really enjoyed the private lesson and highly recommend Mele for anyone who would like to learn or improve playing ukulele in Maui (during vacations or not)."